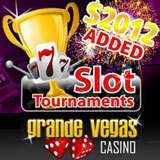 The first major event of the year at Grande Vegas Casino will be its $2012 Add-on Slot Tournament. Registration opens tomorrow for the $12 buy-in event. The tournament begins 1st January and players have until 6th January to achieve a top score and win cash prizes. In slot tournaments, players play slots against other players. The top players scoring the highest number of points get prizes with monetary value. Prizes are usually determined by the number of competitors registered, but in this case the casino is putting an extra $2012 in the prize pool. After paying a small buy-in, players receive a certain amount of starting credits and have a specified time period in which they can attempt to achieve the highest score. Scores are posted on the leader board where players can check their ranking and see the score to beat. Grande Vegas has more than 300 casino games, including slot machines, video poker and table games like Roulette and Blackjack. Its new 50-line Monster Mayhem slot machine with its million dollar progressive jackpot is one of its most popular. Spaces are limited so players are encouraged to register early for this first slots tournament of the new year. Registration opens on December 28th.